278 pages | 23 B/W Illus. Being the first casualty of the international financial crisis, Iceland was, in many ways, turned into a laboratory when it came to responding to one of the largest corporate failures on record. 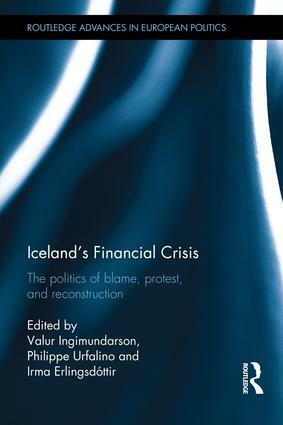 This edited volume offers the most wide-ranging treatment of the Icelandic financial crisis and its political, economic, social, and constitutional consequences. Interdisciplinary, with contributions from historians, economists, sociologists, legal scholars, political scientists and philosophers, it also compares and contrasts the Icelandic experience with other national and global crises. It examines the economic magnitude of the crisis, the social and political responses, and the unique transitional justice mechanisms used to deal with it. It looks at backward-looking elements, including a societal and legal reckoning – which included the indictment of a Prime Minister and jailing of leading bankers for their part in the financial crisis – and forward-looking features, such as an attempt to rewrite the Icelandic constitution. Throughout, it underscores the contemporary relevance of the Icelandic case. While the Icelandic economic recovery has been much quicker than expected; it shows that public faith in political elites has not been restored. This text will be of key interest to scholars, policy-makers and students of the financial crisis in such fields as European politics, international political economy, comparative politics, sociology, economics, contemporary history, and more broadly the social sciences and humanities. Valur Ingimundarson is Professor of Contemporary History at the University of Iceland and the Chair of the Board of the EDDA – Center of Excellence. Philippe Urfalino is Senior Researcher at the French Centre National de la Recherche Scientifique (CNRS) and Professor at the Ecole des Hautes Etudes en Sciences Sociales (EHESS), France. Irma Erlingsdóttir is Associate Professor of French Contemporary Literature at the University of Iceland and Director of EDDA – Center of Excellence; the United Nations University Gender Equality Studies and Training Programme (UNU-GEST); and Institute for Gender, Equality and Difference (RIKK), University of Iceland.